Thank you for helping the CWG Helping Outreach continue our mission. Your tax-deductible contribution to the Conversations with God Foundation helps keep the site running and allows for future improvements! This site and the activity here is absolutely free, and we want you never to feel an obligation of any kind to make a financial exchange for your participation. I’m happy you have come here and hope you will return as long as you feel benefited from doing so. If you would like to support this activity, I invite you to consider sharing $10 or more as an expression of your agreement with what you see happening here. This small amount would assist us in covering our costs here. Thank you so much for helping cover expenses in this way if you can. 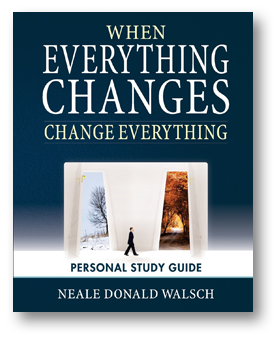 As a special thank you for your contribution, you will be offered a downloadable version of the When Everything Changes, Change Everything Personal Study Guide. To receive it, please be sure to click the blue “Return” link when you are finished making your Paypal donation. To receive your book download, you MUST click the link to return to the site after donating.